At Advance Iron Works, we can craft and install security window guards for any size or shape of residential or commercial window. Our window guards comply strictly with all current safety and building codes, and include the most up-to-date fire release emergency exit safety features, including quick release and grab lever release systems. We also retrofit older, existing window guards with this updated fire release technology, bringing them into compliance with today's safety and building codes. 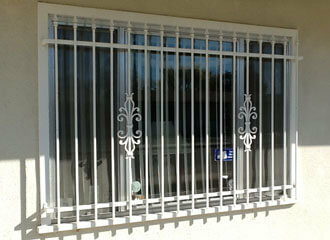 Our window guards are available in many styles ranging from the strictly functional to the highly elaborate and ornate. They are available in a galvanized finish, and can be painted in a wide selection of colors to complement the exterior of your home or business. Look no further than Advance Iron Works when you are seeking stylish, yet highly effective security window guards for your residential or commercial property. However, providing effective security for your home, business, or commercial property does not have to come at the expense of your home or building's appearance. At Advance Iron Works, all of our custom-made window guards are artfully designed to complement your home or commercial building's exterior, and are available in a wide selection of designs which will enhance the look and curb appeal of your home or business. Our knowledgeable installation professionals will expertly install your security window guards observing the highest safety standards, and can suggest further enhancements to provide additional security, because your peace of mind is very important to us. Advance Iron Works is licensed, bonded, and fully insured.